Ombre Hair - What is it? In French, ombre means “shade” or “shadow.” In the hair color world, ombre is a dramatic, two-toned hair color effect that is typically darker at the top and lighter on the bottom. Often the dark, top section is your natural hair color shade and the bottom section is lightened with hair lightener. Ombre comes in virtually any color from natural blonde, brown or red, to something unconventional like pink, blue, green or purple. 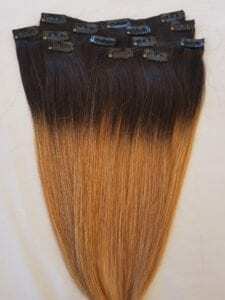 This versatility in colors is one of the major reasons so many women are making the switch to ombre hair extensions. Another major bonus with ombre hair is that it’s easy on the budget. You don’t have to touch it up very often since the top section remains dark. The easiest way to apply ombre hair extensions is Hair Faux You's selection of clip-ins. They make hair extensions easy and blend naturally with any style for short to medium-length hair. If you have short or medium length hair, you will be able to wear ombre hair extensions without already having your own hair ombre colored. When purchasing ombre extensions simply match the base color of the extensions to your own hair color and then choose the ombre color you want. Keep in mind, a more natural fade will look most natural, for example, the chestnut brown ombre is the most popular as it looks natural and blends well. Lighter ombre will work if you have a stylist cut and blended your hair. If you have long hair you will need to have your ends ombre colored so make sure that the extensions you choose match your current ombre hair. Keep in mind that you can go 1-3 shades within your ombre colors and it will still blend well. Is Ombre Hair Extensions Right for Me? If you want to add easy color to your hair, ombre extensions are perfect for you! It makes a statement that can make a huge difference in your look with easy to maintain style. So, if you're creative and adventurous with your personal style, call Hair Faux You today! Still, haven’t made up your mind if ombre or balayage clip-in hair extensions are right for you? Here are just a few of the major benefits of these extensions that are sure to swing your choice in the right direction! 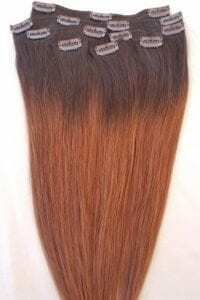 Get your hair looking colored and stylish today with our wide selection of ombre-style hair extensions!